The hourly rate that is charged for running a piece of manufacturing equipment, excluding any labor costs. The machine rate may include the equipment cost, auxiliary costs, maintenance, plant overhead, etc. Chemical symbol Mg, Atomic number 12, atomic weight 24.312. A silvery, moderately hard, strong, and light metal. Used in ductile iron production, steel desulfurization, and chemical reduction. Growing use as substitute for aluminum and zinc in die castings, due to light weight, high strength and low cost. The time required to manually change a tool in the spindle or tool changer, which includes the time to stop the spindle, remove the current tool, insert the new tool, and start the spindle again. A manual tool change is performed if the machine does not use an automatic tool changer, as well as for replacing a worn tool. A markup to the cost of purchased material that may include overhead costs of storing the material, any labor costs in handling or transporting the material, as well as profit. The rate at which material is cut away from the workpiece during a machining operation, measured as a volume per unit time, typically cubic inches per minute. The percentage of material used that yields finished parts. 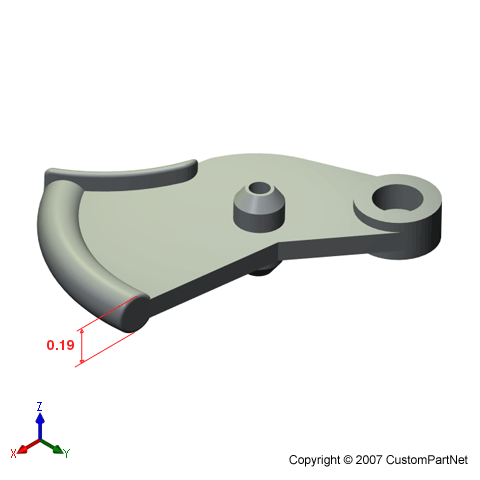 In one molding cycle, this describes the percentage of the shot that fills the part cavities. The highest recommended temperature that a polymer can withstand under no load and without a degradation of its properties. The Deflection Temperature measures the maximum temperature a polymer can withstand under load. The Maximum Service Temperature is also called the Maximum Operating Temperature. The thickest wall or feature of a part. In molding processes, the maximum wall thickness is used to determine the cooling time because that section will require the most time to cool. In some parts, the thickest section can be easily identified (Trigger), but often several sections should be checked (Button). When measuring the maximum wall thickness of a given section, the smaller dimension is considered the thickness (Knob). Those properties of a material that reveal the elastic and inelastic reaction when force is applied, or that involve the relationship between stress and strain; for example, the modulus of elasticity, tensile strength, and fatigue limit. These properties have often been designated as "physical properties," but the term "mechanical properties" is preferred. The price per pound of melting raw material in a foundry, which includes direct and indirect labor costs, equipment costs, and overhead. The percentage of material that becomes unusable, and hence lost, during the melting process. Melt loss is typically a result of oxidation during the melting and holding of the material. A machine that rotates a cutting tool at high speeds and moves it into a fixed workpiece to cut away chips of material. A milling machine may be operated manually or by computer numerical control (CNC) to perform a series of operations. Such operations may include face milling, end milling, chamfer milling, drilling, boring, counterboring, reaming, tapping, or an idle operation. Also called elastic modulus and coefficient of elasticity. A measure of the rigidity of metal. The ratio of stress, below the proportional limit, to corresponding strain. Specifically, the modulus obtained in tension or compression is Young's modulus, stretch modulus or modulus of extensibility; the modulus obtained in torsion or shear is modulus of rigidity, shear modulus or modulus of torsion; the modulus covering the ratio of the mean normal stress to the change in volume per unit is the bulk modulus. The tangent modulus and secant modulus are not restricted within the proportional limit; the former is the slope of the stress-strain curve at a specified point; the latter is the slope of a line from the origin to a specified point on the stress-strain curve. Mold class refers to an industry standard provided by the Society of Plastics Industry (SPI) for classifying the quality and lifetime of molds. Class 105 (<=500 cycles): The least expensive type of mold, which can be constructed from cast metal or epoxy, and is to be used for prototypes only. Class 104 (<=100,000 cycles): A low priced mold with mold cavities typically constructed from aluminum or mild steel. Class 103 (<=500,000 cycles): A moderately priced mold, also the most common, requiring cavity and cores to be of a hardness of 28 R/C or higher. Class 102 (<=1,000,000 cycles): A high priced and high quality mold, requiring cavity and cores be hardened to 48 R/C and all other mold components be heat treated. Class 101 (>1,000,000 cycles): The most expensive and highest quality mold, requiring cavities and cores be hardened to at least 48 R/C and all other mold components be made of hardened tool steel. The total cost of a mold or die, which may include the material, machining, auxiliaries, maintenance, etc. The temperature of the interior mold surfaces before the molten material is injected. Usually, cooling lines inside the mold keep this temperature low and aid in cooling the molten material. The power required from a machine's motor to rotate the spindle during a machining operation. The spindle horsepower will typically be less than the machine's motor horsepower due to the machine efficiency being less than 100%. The motor horsepower required for any operation must be less than the rated horsepower of the machine.